Back to the point. Yesterday we went to a friend's house to celebrate her birthday. As we were getting ready to leave, her husband, Carl, told us he wanted to show us something before we left. Carl had made a skateboard with blades on it instead of wheels, upon which he attached a sail (Carl has also made, among numerous other things, his own telescope, so this was not a particularly surprising feat coming from him.) It was sort of a poor-person's iceboat. He was going to go out on the lake today if the wind was strong enough, and invited us to join him. The wind was, indeed, strong enough, so we met Carl and his daughter on Lake Monona. We brought our ice-skates along so anyone who didn't want to try the ice-board, or whatever it's called, would be able to skate instead. It was a beautiful day: clear and not too cold, but cold enough that the ice wasn't soft. Here's the board with the sail lying behind it. Carl, in a rare moment when he was close enough to photograph. Carl explains how it all works. This is me on the return leg of a run across the ice. There was also a small flotilla of iceboats out on the lake. Here's one of them. Downtown Madison as seen from Lake Monona. Carl and daughter Melinda out on the ice. Ms. Geranium (a.k.a. Luminiferous Ether) and Melinda preferred their ice-skates. Video of the beginning of a run across the ice, courtesy of Luminiferous Ether. I'm in the middle of Hogfather, by Terry Pratchett. I like to read this book every year at Hogswatch. The Hogfather has gone missing and Death is filling in while Susan, Death's granddaughter, tries to figure out what, exactly, is going on. Excellent book. "Everything starts somewhere, though many physicists disagree. But people have always been dimly aware of the problem with the start of things. They wonder how the snowplough driver gets to work, or how the makers of dictionaries look up the spelling of words." "+++ Divide By Cucumber Error. Please Reinstall Universe And Reboot +++"
Happy Hogswatch, everyone! I hope the Hogfather was good to you. Readers of this blog and others who know me are probably aware that I have been a big supporter of the Toronto based group Enter The Haggis (some of you may be tired of hearing about them, but you really need to check them out!). Last Wednesday they made their third appearance here in Madison, WI. They've been here about once a year since their first show in the area and, although Madison hasn't been a particularly lucrative stop for them on their tours (it hasn't helped that every time they've played Madison it has been a Wednesday night), each time they have had a better turnout than the time before. This year, I volunteered to work on their "Street Team", which means that I did what I could to help promote the show. I was pleased that there was standing room only last Wednesday. I'd like to think that my efforts were partly responsible for the large crowd in attendance, but who knows? Why, you may ask, did I work to promote someone else when I really ought to be spending more time and energy promoting my own musical endeavors? The answer isn't entirely clear, even to me. I can only say that listening to their music and seeing them perform has brought me an awful lot of joy since I first heard them about three years ago and I'd like to share that with other people. Besides, a group this good deserves to be able to make a living playing music. They'll either burn out after a few years or they will have enough success that they'll find it worthwhile to continue. Personally, I hope it will be the latter. ETH is unique, in my opinion. Great song-writing, five stellar musicians, brilliant arrangements (every note they play serves the greater good of the song rather than trying to impress people with their virtuosity), their songs span a wide array of styles and they appear to have a great time playing together. It's a rare combination, and it doesn't hurt that they're also very nice people off the stage. After Wednesday's show I chatted with (pestered?) individual members of the band and found it rather refreshing that, after all the touring and gigs they have played, they still seem surprised that people find them to be exceptional. As I've come to expect after seeing them five times, it was a great show. I urge everyone to see these guys if they come anywhere near you. Here's a clip from their recent appearance at Shank Hall, Milwaukee, WI on June 17, 2009. They're playing "DNA" from their latest album, "Gutter Anthems". This song falls into what I think of as their "pop song" style. It's representative of some of their music, but one song doesn't begin to illustrate the range of material they perform on any given night. To any guitar players watching this, take note of what guitarist Trevor Lewington's right hand is doing at about 2:15 and again at 3:55, and compare it to what you're hearing. It looks as if he's pounding out chords, but he's also playing a lead line at the same time. Kind of cool, don't you think? Craig Downie: bagpipes, penny whistle, harmonica, guitar and vocals. Brian Buchanan: fiddle, keyboards, guitar, vocals. Check out this live video of ETH and opener Zachary Scot Johnson at 7th Street Entry, Minneapolis, MN on November 10, 2009. ETH starts about 51 minutes into the clip. Mock flyer by Jeff Muendel. 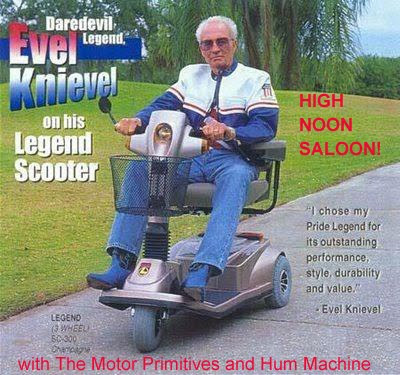 Sorry, Evel Knievel will not actually be appearing. The flyer was Jeff's idea of a joke. I thought it was pretty funny. Greetings, once again, to all life forms who happen to have the misfortune of being visitors to this blog! "What is it this time?" you may well ask. And well may you ask. Well, since you may ask, it's an opportunity to hear and see The Motor Primitives and still get home by bedtime! Is that awesome, or what? Wait! Please don't all talk at once! I can't hear myself type! If you haven't gotten a chance to see us with our new drummer, Kenn Busch, now is a chance to see us with our new drummer Kennn Busch! Hopefully, you will have other opportunities to see us with our new drummer, Kennnn Busch, but life holds no guarantees, so why not come and see us with our new drummer, Kennnnnnnnnnnn Busch, at this time? And, to top it off, you will also get to see the legendary Hum Machine in a rare appearance. Who? The Motor Primitives and Hum Machine. What? Ummm..., The Motor Primitives and Hum Machine. Where? The High Noon Saloon, 701 E. Washington Ave, Madison, WI, 53703. When? Friday, October 23, 2009. Doors open at 5:30 p.m., music starts at 6:00 p.m.
Why? Because we like you! And, if you don't show up, I might cry (but in a sincere, sensitive and manly way, not in a manipulative, stupid, lame and weasely way like Glenn Beck). How much? $4. Seriously. It's ridiculously cheap..., errrrr..., wait..., ... our marketing department is now informing me it prefers the word "affordable" over the word "cheap." They also like it when you use the word "value." Okay, whatever, it's ridiculously affordable (wink, wink, nudge, nudge.) A great value. (I refuse to use the phrase "bang for your buck", though. I'm just not going to do it, regardless of the hand-wringing it may cause our marketing department.) 2 for 1 drinks on top of it, or so I'm told. Bring the whole family. If your kids are under 21, they must be accompanied by one or more parents. Hi, everyone. First of all, please accept my most sincere apologies for my absence over the last few months. Getting used to my new job has taken more energy than I would have anticipated, leaving both less time and less energy for blogging and blog reading. Funny. Anyway, I thought all my loyal readers (how can someone be a loyal reader when there is nothing to read? That must be one of those "If a tree falls..." kind of questions. Maybe I should have written "loyal would-be readers.") might be interested to know that I was recently interviewed on Northern Spirit Radio's weekly show called "Song of the Soul". If you're interested, you can listen to it here. I enjoyed talking with host Mark Helpsmeet and having the opportunity to share some music that was meaningful to me in a spiritual sense. First, I had to make sure that the fact that I'm not affiliated with any religious or spiritual organization or philosophy wouldn't be a problem for the show. It was also a challenge to pick music that fit the theme of the show rather than choosing music just because I like it. Of course, everything I chose was something I like, but the theme guided my selections. I found the most difficult aspect was weeding it down to 25 minutes worth of music. Mark was able to edit the music to fit the time slot, so not all songs are presented in their entirety. If you wish, you can seek them out in full. Warning: you might think from the presentation that I'm a real musician. Don't be fooled. I'm just another hack who likes to play and has enough skill to get by. I had a second interview today, after which I was offered a job. I start next week. I'll be working at Spruce Tree Music, a local independently owned store which sells and repairs stringed instruments. Guitars, violins, harps, ukuleles, etc. It sounds like my duties will be varied, from cleaning, tuning and setting up instruments to answering phones, helping customers, and learning repair. I'm pretty excited about it. The salary is a little lower than what I was earning at my previous job, but I'm okay with that. It's going to be a relief to have a more regular source of income, and working for a local independent business, not to mention working with musical instruments, appeals to me as well.